England Netball has made the decision not to include the Junior Dragons in the Netball Performance League for 2017. Welsh Netball was informed that this decision was made in order to keep the pathway within England. In light of this decision, Welsh Netball has been given the opportunity to review its Performance Pathway and make positive changes within its structure. this elite group of players, thus ensuring that Wales continues to produce the best and most talented players possible. Head of Elite Performance, Trish Wilcox said, “This decision has presented us with the opportunity to re-visit our Performance Pathway. 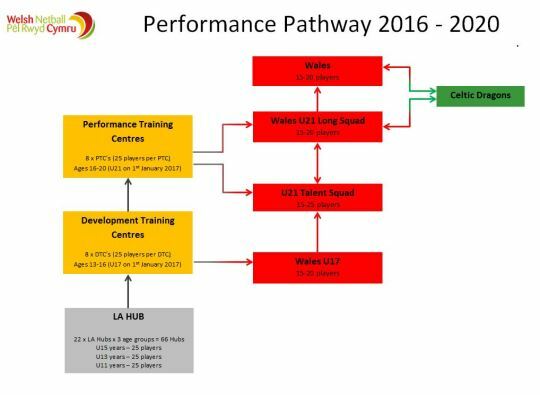 As a result, the new Welsh Netball Performance Pathway will ensure that there is a clearer link from LA Hubs through to elite senior teams. “We have already put steps in place to ensure that our Under 19 players continue to get competitive match play,” said Trish Wilcox.